As someone who really enjoys cooking and also really enjoys eating, I find that my travels to one place or another often involve a fair amount of regional cuisine sampling. 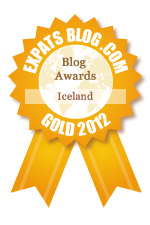 I think it really helps you to get to know a place by trying out some of the local food. So, I ate gemischte frühstück (large breakfast) in Germany, Smørrebrød in Copenhagen, poutine in Toronto (I know, it’s a Quebecois thing, but we didn’t make it that far), and raw herring with onions sold from a streetcart in Amsterdam, to name a few. Here in Iceland, I’ve been doing a great deal of cuisine sampling, of course, but am also now venturing into Icelandic cooking with some very tasty results. My foray into Icelandic cuisine has been mainly directed by several sources–the website Jo’s Icelandic Recipes, for one, and also Nanna Rögnvaldardóttir’s Icelandic Food & Cookery, an English-language version of one of Nanna’s paired down Icelandic cookbooks, which I just can’t recommend highly enough. 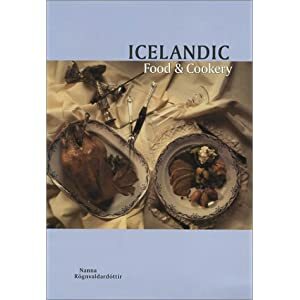 Nanna is an award-winning author of many Icelandic cookbooks, and when I found her English cookbook on the library shelf just next to several of her other beautiful, and incredibly extensive cookbooks in Icelandic (with sweet titles like Matarást, or Food Love), I knew I had found a winner. I could add so many more of these tidbits, but then I’d basically be transcribing her book. I’ve basically read the whole thing from start to finish now, and it has been really edifying.